Yay! How exciting! A bouncing baby boy! 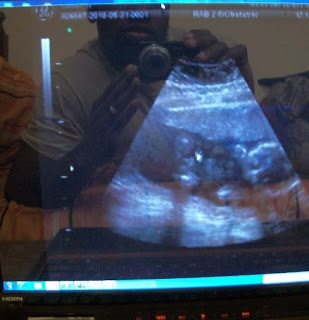 I think it is wonderful your husband got to watch the ultrasound! How wonderful technology is! Lots of thoughts and prayers your way! Keep growing! Congrats! Do you have a name picked out? It's such a great pic. You can see your husbands smiling in the background. Just awesome! Congratulations! That's so awesome!! I'm so excited for y'all!! Great picture too!